Coming from SDL Studio, the first thing I had to do was migrate some of my translation memories and termbases. I previously wrote about TEnTs interoperability, and because both SDL Studio and memoQ support standardized file formats for data exchange, I knew that this isn’t going to be a problem. Note that metadata (such as customized fields in TMs or Termbases) that is not part of the standardized formats specification might be lost in the process, but for me it wasn’t a big issue because I try to keep my data structure as simple and universal as possible. menoQ 2014 is a major release that introduced many (according to Kilgray more than 70) new features and improvements, so I thought to start by going over those I think are most significant. This is arguably the most significant addition in terms of workflow. Project templates automate the project creation process for recurring or running projects. There is no longer a need to reattach the same translation resources (TMs, Termbases, LiveDocs corpa) and other light resources (i.e. project-related settings) when manually creating the same project time and again, nor to maintain container projects. SDL Studio 2009 has introduced a similar concept, and over the years I grew to relay on project templates more than I have initially expected. To be honest, I would have probably felt restricted in memoQ without this newly added feature. 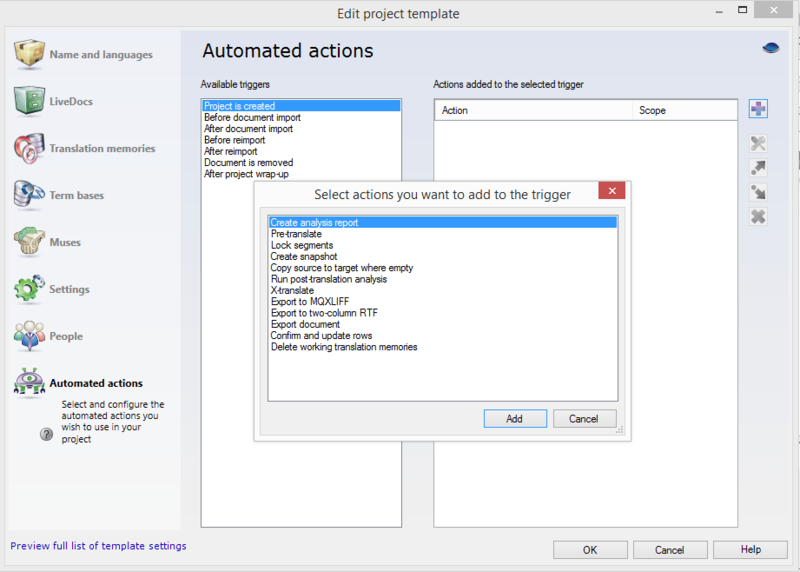 Furthermore, the project template feature introduced a new setting – Automated Actions – that can be used to setup certain automated actions that will take place during project creation, file importing, and wrap up. A project template with automated actions offers a great deal of flexibility, and it can be as minimal or elaborate as needed. Another new concept under the project template framework is the introduction of two separate translation memories: The Master and Working TMs. The Master TM is used for pre-translation and as a reference, while the Working TM stores all the confirmed segments in that specific project. Having two TMs can be useful, for example, for sharing only the project-specific TM without having to extract the relevant entries from a larger TM; or for using the Working TM as a buffer that can be edited and manipulated as needed without affecting and cluttering the Master TM, but if the experience of SDL Studio – that introduced a similar concept (Main and Project TMs) – is any indication, this separation can also create a great deal of confusion. It would be interested to follow how this concept is received and used by memoQ users. The Translation Tab in memoQ 2014 has been revamped to better display the most important information. A new graphical progress bar was added, the filtering and sorting options were improved, and two new buttons: Structure and Details were added. The Structure button is used to switch to a hierarchical structure view of the project files – including any embedded objects and images (more on this shortly), while the Details command brings up the details pane with a summary of project or file information. This is a nice redesign that presents the user with the most important information at a glance without digging for it. In addition to the traditional way of inserting tags, memoQ introduced the Tag insertion mode (keyboard shortcut F6) for inserting or removing tags from a segment. Sometimes there is a legitimate reason to remove tags from the a segment, and doing this directly in the editor environment without having to make the changes in the source document makes life so much easier. memoQ 2014 also introduced the Arrange Tags command that automatically arranges the tags in the target segment according to their order in the source segment. This is a nice and easy fix for those occasions in which the tag order gets out of hand. This is another significant workflow improvement. memoQ 2014 can directly extract and import any supported embedded file format, thus eliminating the need to extract those embedded objects manually and handle them separately. There is one limitation to keep in mind, though. Currently only objects that are one level deep in relation to the original document can be imported, but this shouldn’t be an issue in most cases. 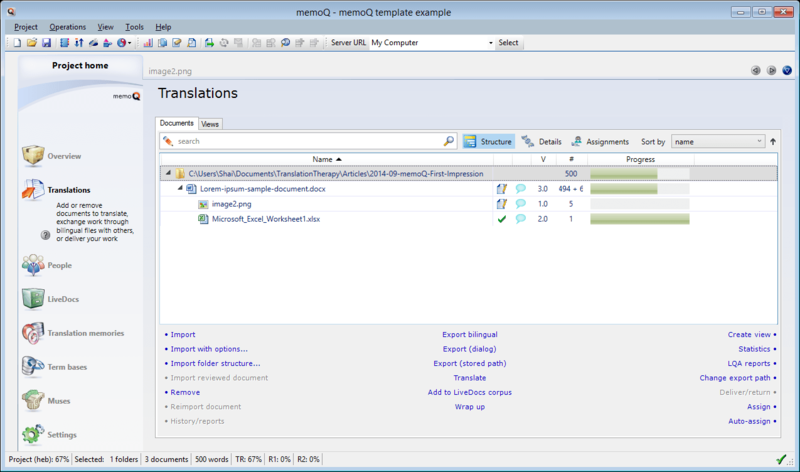 memoQ 2014 uses a similar technique to handle embedded images. The images are extracted and prepared as a localization package that the user can review, transcribe, add comments or instructions, and when the translation is done automatically re-import back to the project. I usually don’t work with images, but I played around with this feature and it seems to work. The new PhotoShop text filter allows to import PSD files and translate their embedded text layers. I usually don’t work with PSD files, but any filter that directly import content into the translation environment is a welcome addition. I’ve long since argued that a change is needed in the the way translation fees are discussed. As independent professional service providers we sell our time and expertise, and therefore I argue that the most important metric to have is hourly earnings, and that the hourly earning should remain consistent across different workflows and work types. The key here is to accurately estimate how much time a project is likely to take, and use it to determine the project fee that in turn can be converted to whatever base unit one is most comfortable working with as needed. Time measurement is also a key metric in evaluating how changes in the workflow actually affect productivity, and for verifying that the project progresses as expected. For these reasons, I’m happy to see that a time measurement mechanism is implemented into more TEnTs (in SDL Studio this functionality can be added through the Studio Time Tracker Open eXchage app). I might have done something wrong, but while testing this in memoQ the results didn’t seem to be very accurate, and that is a little unfortunate. However, this is a newly introduced feature and Kilgray has a proven track record of refining and improving features that were a little crude when first introduced. A better TaaS (Terminology as a Service) integration: The cloud based Terminology platform. Personally I’m not too keen about cloud services, but others seems to like them and I heard that TaaS has a great term extraction capability. Existing term warning: Now a warning is displayed when trying to add a term that already exists in the Termbase. Duplicates removal from TMs and Termbases: The TM and Termbase editors can now automatically remove duplicate entries. Any automation of this kind is always a welcome addition. Rename projects and resources: Projects and other resources (TMs, TBs, etc.) can now be renamed. I would argue that a frequent use of this feature is probably an indication of an underlying inefficiency in the workflow that needs fixing, but it could come in very handy for the odd occasion when renaming is needed without breaking up the entire project. Joint view of files with preview: The preview function now works with Views. I like to refer to a LiveDocs corpus as a huge contextual reference repository, and find it particularly useful for running concordance search. I don’t use a the project management capabilities that most commercial TEnTs offer, so once I’m done with a project I usually remove it from the project list. In this scenario, sending the completed project to the LiveDocs corpus before removing it from the list serves as a form of archiving. 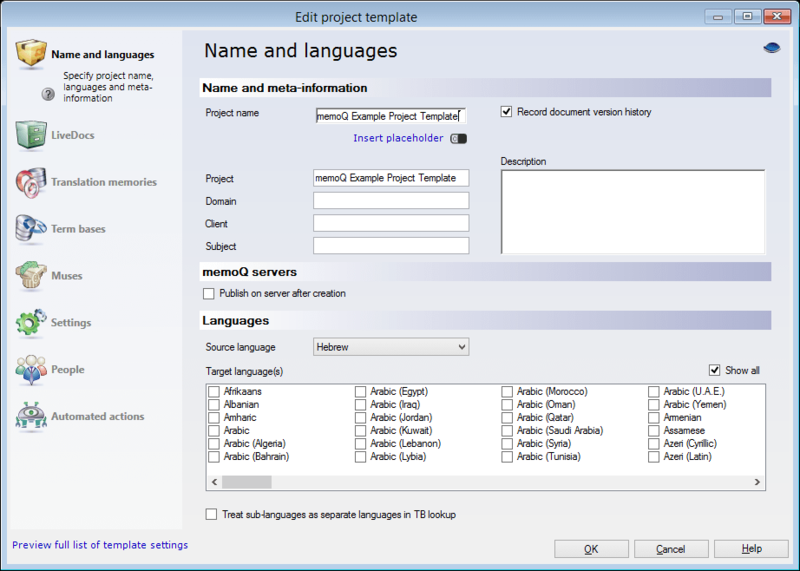 A memoQ project can matintain different versions of the same document. This is quite a powerful feature for managing new versions of a previously translated documents, especially updating revisions of documents in highly regulated fields such as legal and pharmaceuticals. Using the the X-translate feature, the translation from the previously translated version of the file is applied to the new version, bypassing the TM entirely, thus making sure that the new version will not be populated with statistically correct but otherwise wrong segments. However, versioning works only in a project (I think), and with the introduction of the project template based workflow that should make container projects redundant, I’m not sure how this will work. A View in memoQ is a collections of segments from some or all project documents. 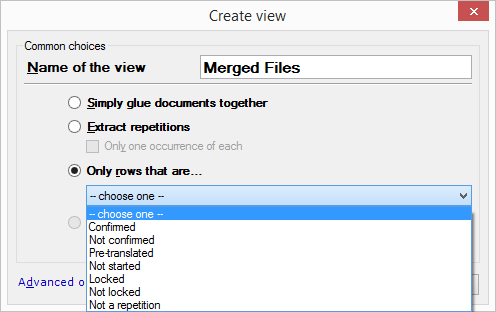 In its most basic form it is used to virtually combine (or ‘glue’) several project files (similar to the Quick Merge feature in Studio 2014), but more complicated views can be created to split documents, extract repetitions or create a view containing only certain segments with specific attributes, such as errors, status, comments, etc. The flexibility of running a second layer of filtering can save time and effort. memoQ gives the users control over the folders and files locations, and the naming conventions. The default settings work well – especially for the default workflow – but the ability to to customize the names and locations is greatly appreciated. memoQ is (almost) independent of external third-party libraries. The immediate benefit of this is that there are only very few things that can get broken outside of Kilgray’s control, and in the long term I believe that it contributes towards are consistent and uniform user experience. This is one of the features I was really excited about. Before finalizing a project I like to review the translation in its native format. I never found the sentence/paragraph segmentation restrictive, yet reviewing the translation in its native format gives a different perspective that for me helps in ironing out minor kinks and putting the finishing touches. The challenge with this workflow is carrying these edits back to the editor environment without having to do them twice. As an acceptable workaround I usually use some kind of preview mode to review the translation, while making the edits in the editor environment. A little clunky, but generally works. This is why I was really excited to try memoQ’s Monolingual Review feature that was first introduced in memoQ 2013 R2, and while not perfect, I’m happy to report that it works well and is a real time and energy saver. Monolingual review can also be used for implementing edits by an external editor in the translated document. After mere three months of use I’m not even near an expert memoQ user. I still have lot to learn, and lacking some historic perspective about memoQ’s development from a user’s point-of-view, I might be wrong about some things or go about them the wrong way. If I am, please feel free to correct me in the comments. I particularly like how the defaults work well out-of-the-box, but memoQ offers many customization options to accommodate different workflows. I was also happy with the relatively small size of the software, and its performance. I did find memoQ’s user interface to be a little cluttered, and the project folder structure obscure, but these are minor issues. Overall, I have found memoQ to be a very capable, flexible, and robust TEnT; and I enjoy using it. I have been translating for a decade now, mostly as a side job, but lately i am starting to get larger projects, many documents, thounsands of words, and very repetitive which consume a lot of energy and are sources of headaches. I have this week started to play with trados 2011, so far im not liking it, too complicated (but is also my first experience with such software), I am about to try the 2014 version of it, to see if it is a bit better. Never heard of MemoQ, but I liked your review. What would you recommend me? To invest time and effort in which one of them? Hello César, and thank you for your comment. If you are looking into SDL Studio, I recommend looking into Studio 2015 (the most recent version at the time of this writing, October 2015). As a rule-of-thumb, when trying a new tool it is better to try the most recent version instead of older ones. Studio. memoQ (now also in version 2015), and all other Translation Environment Tools (TEnTs) can seem overwhelming at first, but they really follow a logical workflow. Forget about the features and all the marketing babble, this can indeed get confusing. The more important thing for you to understand is your own workflow, and how to integrate the tool into that workflow. The basic workflow of all these tools is very similar and quite simple: You create a project, add the source files, add/create a TM and a glossary (these are recommended, especially a TM, but optional), translate, and create the translated document. They even create a default folder structure for organizing projects and resources, and while personally I don’t think it is necessarily ideal, it is good enough. For this basic type of Workflow there is almost no difference between all the TEnTs. They will all handle it perfectly fine. What I would recommend you at this point is to start with OmegaT: an open source, free, and very capable TEnT. This will allow you to better understand the basic workflow concepts of working with a TEnT, and you might even find that OmegaT is all you really need. After you’ll get more familiar and comfortable with using a TEnT, you could explore some of the more advanced features of OmegaT and/or the commercial tools. Thank you very much for your detailed response!! Indeed I was trying and trying to get the feel of trados studio 2011, and I found it only to be time consuming and a headache, particularly the creation and use of TMs. I will definitely try the open source you mention. You will find that all the major tools offer the same basic workflow and experience. It is more of a matter of preferences about the little things than anything else. Therefore, Wordfast is a perfectly legitimate option with the caveat that in the last couple of years its development was very slow. When working with Studio you should focus first on the concept of a project: a container of the source, translation, and all accompanying translation resources (TM, glossary, etc.). You create or add the TM when first creating the project (in the screen after the one into which you add the source files). If you need any help with that, I’ll be happy to help you figure it out.